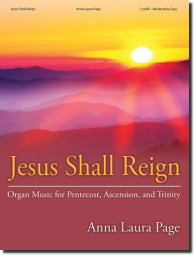 The seasons of the church year that follow Easter, including Ascension, Pentecost, and Trinity Sunday, have sometimes received less attention in the organ service-playing repertoire. Anna Laura Page's collection of hymn arrangements for these late spring and summer Sundays will provide a wealth of useful material with straightforward and easy-to-play pieces. All of the hymn tunes employed are well-known, and several of the pieces combine multiple hymns. All Hail the Power of Jesus´ Name!